Learn how to make your own simple and inexpensive trap to capture these destructive insects. If you ever discover a dime-sized hole in the wood siding of your house, pick up a small, pliable twig and thread it into the hole as far as it will go. Chances are the stick will make an abrupt turn and then slide about 6 inches into the aperture. You’ve just found a carpenter bee hole. Imagine hundreds of these holes in the side of a log home - they would weaken the wood, which is why it’s essential to deter carpenter bees. 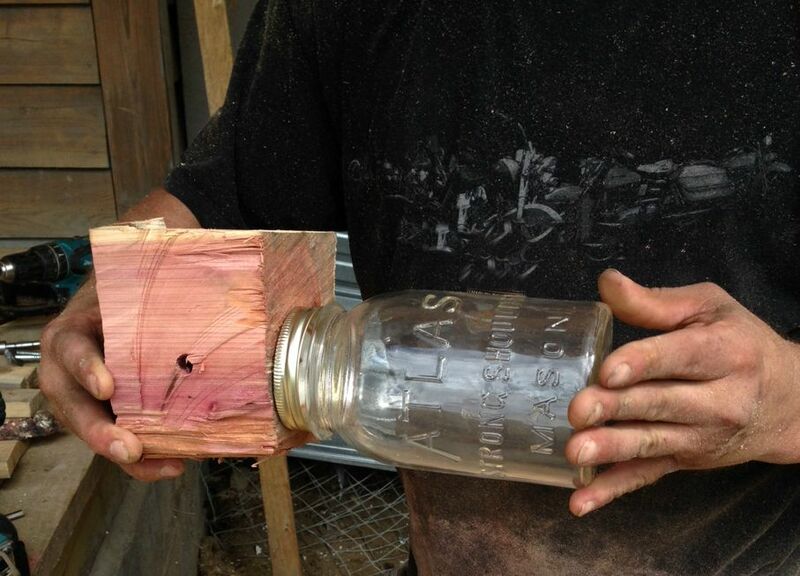 Fortunately, this is a simple task, and a homemade bee trap is often all you need. The great thing about carpenter bee traps is that they eliminate the need to kill bees with pesticide, and they allow you to avoid contact with harsh chemicals. These little snares are super cheap and easy to make, and you’ll be surprised at how well they work. If you have a real bee invasion, you can expect to catch dozens of them by the end of the first week. One 12-inch length of string. Cedar is the wood of choice for this project. 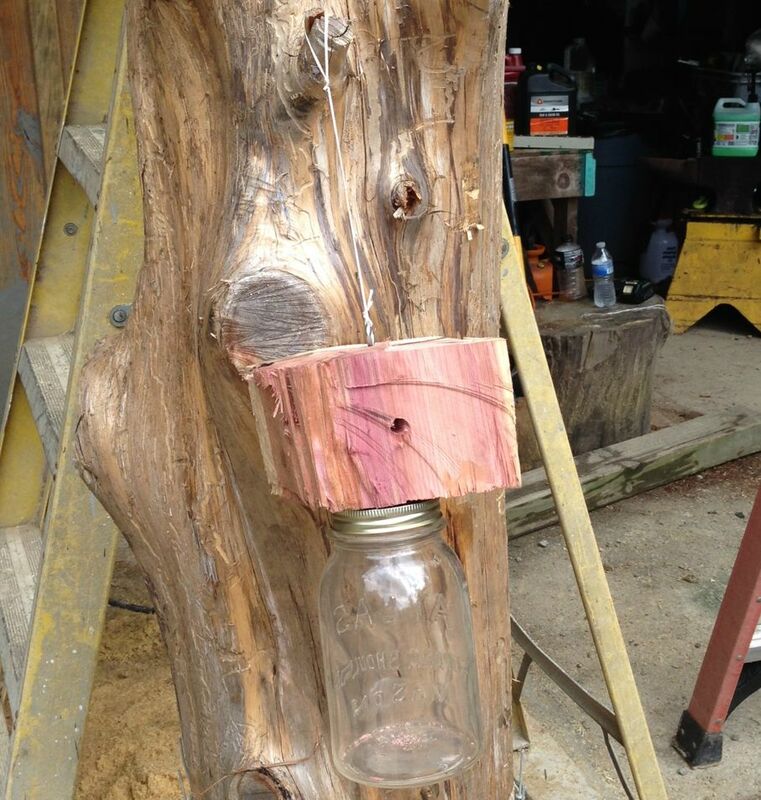 It is resistant to insects and weathers well, making it the best pick for a durable carpenter bee trap. You can go a step further and use stainless-steel screws, which also hold up in the elements. Or you can opt for a large plastic jar. The top just has to be big enough for you to drill three holes. 1. 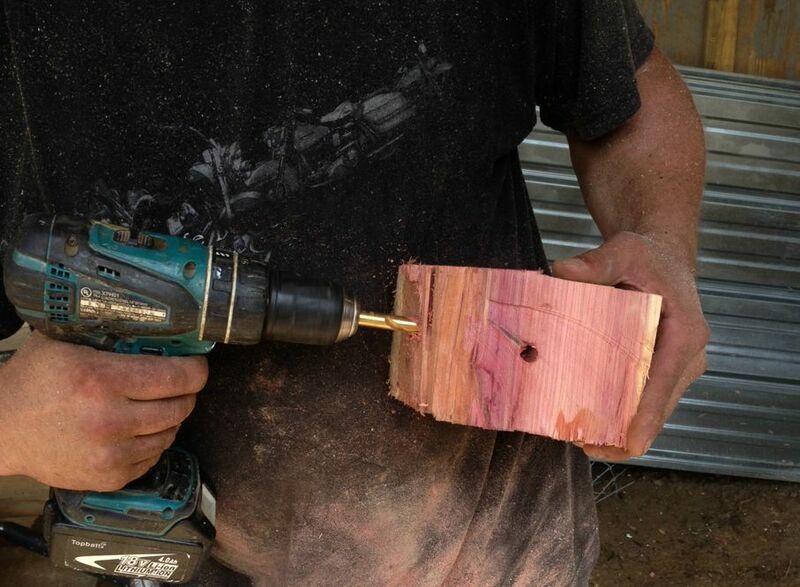 Drill a half-inch vertical hole three quarters the way through your large wood chunk using a half-inch paddle bit. 2. 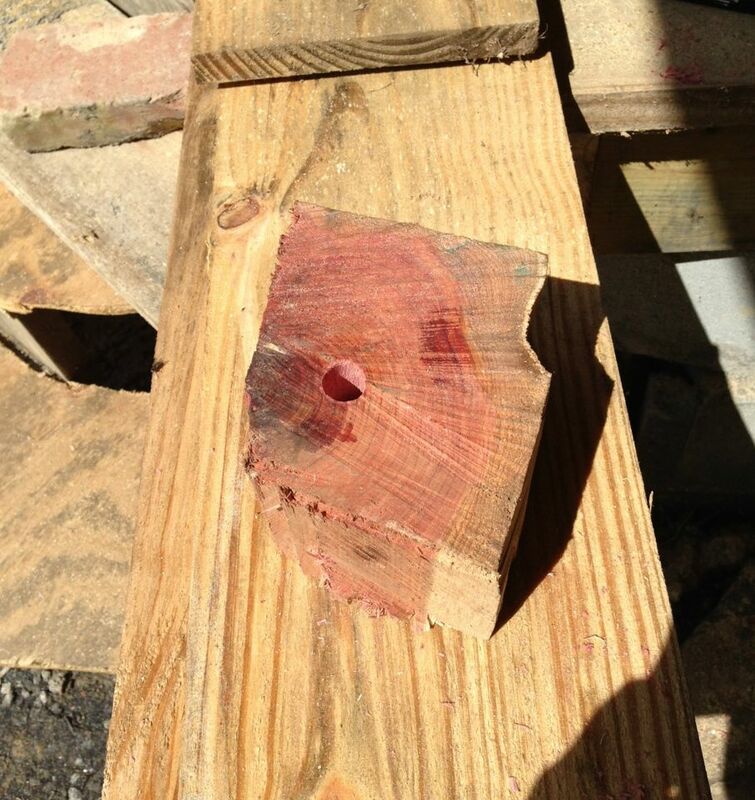 Drill two upward-slanting horizontal holes on each side of this wood chunk until they meet the middle hole. A 3/8-inch round bit works best. 3. Drill a half-inch hole in the middle of the lid with a half-inch round bit. 4. 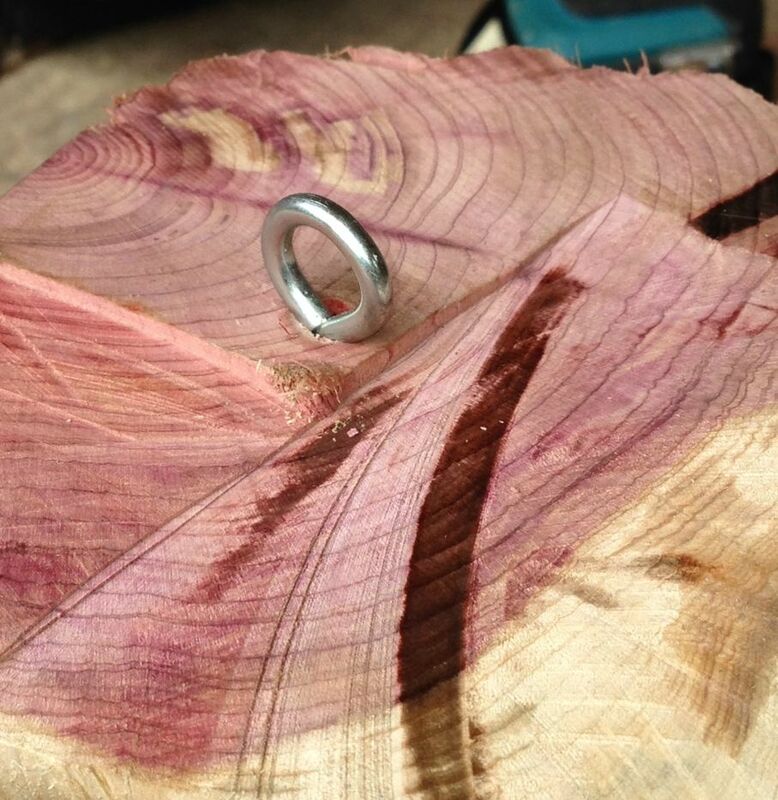 Align the hole in the lid with the hole in the bottom of the cedar chunk and attach the lid to the wood using your two screws and drill. Secure your glass jar to the lid by aligning the threads and turning until tight. 5. 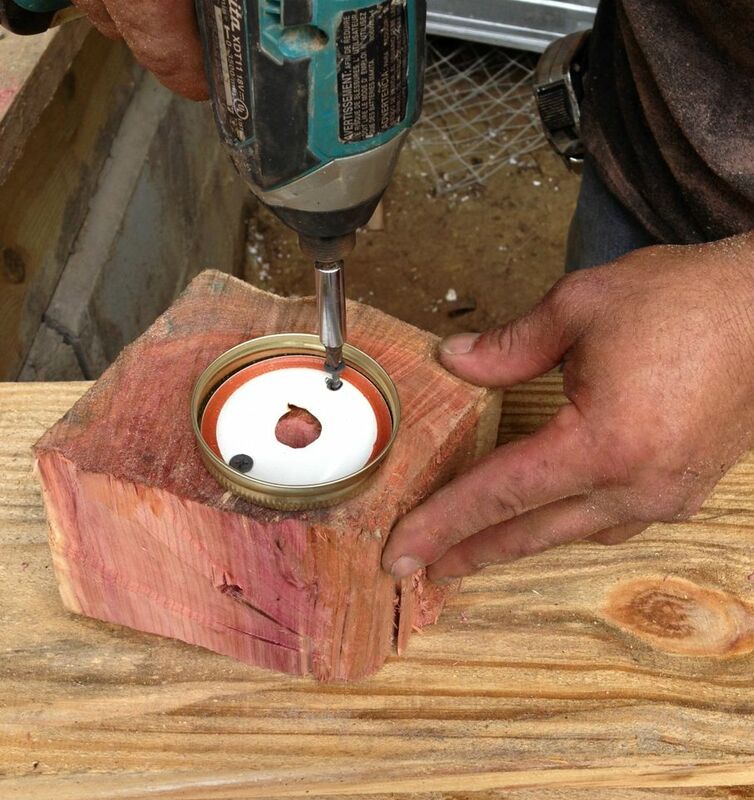 Insert the eye bolt into the top of the cedar chunk and turn it until it is secure. Tie the string through the eye bolt and hang your new trap in a place carpenter bees frequent. Now you’re ready to hang your trap in a hotspot for bees. They’ll enter through the horizontal holes and fall into the jar via the vertical hole. Somehow the bees can’t solve the mystery of how they got into the jar, and they will eventually perish in the glass reservoir. Note that we didn’t treat the wood with any sealer or finish - this was intentional. These substances are typically used on wood siding to deter carpenter bees, so they have no place in a trap you’re trying to draw bees into. Controlling carpenter bees around your wood home can seem like a daunting task if you’ve never dealt with these little borers before. If you choose to go the bee trap route, this inexpensive project is well worth it because you can avoid spraying harsh pesticides near your house and also reduce the damage that these insects can quickly accomplish. A little bit of work goes a long way, as these traps last season after season.